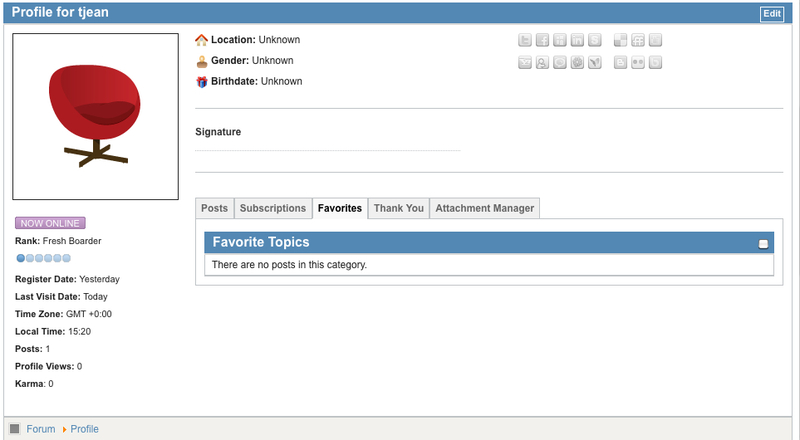 This is what a user profile page looks like. If you want to configure it, click on Edit in the upper right corner of the page on the blue menu bar. You'll be able to edit many things. See the buttons for common social media links? As far as I can tell, you can only have one of each. For some of us, that's a problem, but pick one. You don't have to have them all, nor do you have to enter the ones you have unless you want to. Posts you've made will appear under posts. Posts you've subscribed to will appear under Subscriptions. If you've favorited a post, you'll find it under Favorites. Thank yous, given and received, are under Thank You. You're allowed to upload images (small ones -- 150k, I believe), so you'll find them under Attachment Manager. The writing pips (and other pips) are still available. We haven't converted the pip page to the new site yet, but I'll link to it for your reference. Signature blocks are currently limited to 300 characters. If you're adding pips, I've been advised this is very limiting, so I'll look into ways to fix this. Perhaps by reducing the size of the folder/file names and perhaps by increasing the character limit for signatures -- or a combination of the two. The "Personal Text" area is kind of a like a tag line. It shows in the sidebar beside the post as "About me" on the bottom of the window. Last Edit: 5 years 8 months ago by jschara.